@Siqi | A tech lover in his ß ! A tech lover in his ß ! Back in April, 2014, I was busy working around various activities simultaneously: robotics project, Django development, machine learning course, readings, etc — all in my spare time excluding my 6 hours spent at school on a daily basis. What I ended up doing is sticking with one project at a time for 3 hours straight, and literally leaving everything else untouched. The result was obvious: no books were read, no courses were followed, no jogging was done and heck! I even couldn’t remember Skype with my parents at least once every two weeks! I wasn’t productive enough, I got wore out by sticking to one task and I’m not motivated to work on other stuffs since I didn’t know which one I should be working on. That’s when I started Bits, yet another project, but one that might bring an end to all these messy scheduling. The idea was simple: you tell Bits you want to read this book three times a week, Skype with your parents twice a month and go jogging two times a week — and Bits get everything scheduled for you. With simplicity in mind, you don’t need to fill out complicated forms or hesitating between if it’s better to repeat a task every Friday or Monday. You tell Bits what you want, and Bits arrange every bits of your life for you. Using it on a daily basis, I’ve developed achievement mode, statistics report as well as reward mechanism for your first ‘done’s. The better you manage your tasks, the more powerful Bits get. 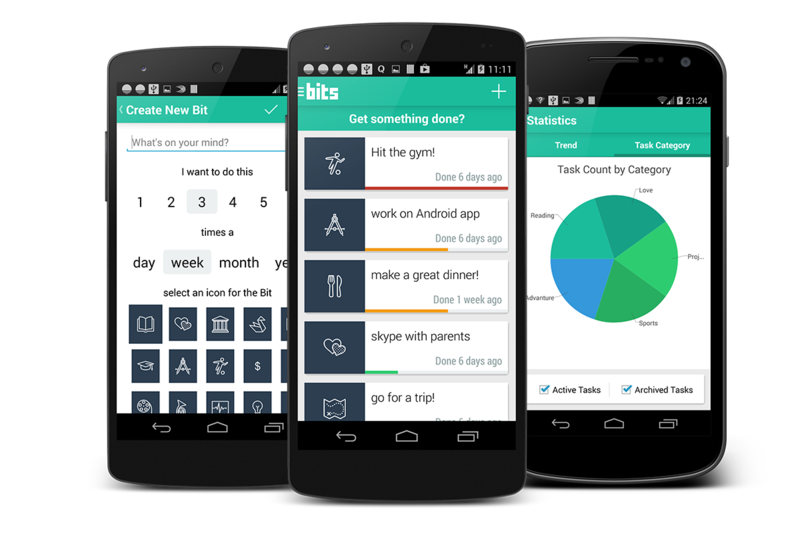 Bits helps me a lot in managing my time in a healthier way, I hope it does the same for you! If you find any bugs or have any suggestions, just say ‘hi’ at android.bitsapp@gmail.com. So true! Hoping for the best! Based on Best Time to Buy and Sell Stock II, I first tried the naive approach to divide the prices in two half, and try to find the max of the sum of the two halves. This works on small test cases but failed on larger ones. Indeed, the complexity was . We can actually do this in O(n). The idea is to scan through the prices forward, and find the maxProfit for day i if we sell on or before day i. We store these in an array (DP). Then, we scan backward and do the same thing. That is, we try to find the maxProfit if we buy on, or after day i. We just need to find the max sum based on these two arrays. Turns out, we don’t even need to keep the backward one, just the maxProfit will do. Both scanning cost O(n) so this would be a O(n) in the end. This solution reminds me of Candy. It seems that these kind of problems which involve solving the same issue from both side can always be solved by scanning forward and scanning backward. Don’t try to do solve these problems in one pass, rather, go forward and backward and solve half of the problem. The big O will give you the same complexity as only one scanning. So the backward scanning is “free”. A naive approach is to use DP and without checking if (i+A[i] > farthest) before running the for loop to check if we’ve found a shorter path. In fact, if this condition is not satisfied, we can never have a shorter path since we can only arrive in positions previously covered in less steps. Only when starting at a position, we are expanding our reachable area, is it possible to update our miniSteps. Also, we will only update starting from farthest, for the same reason. This brings the total complexity to O(n). // thus we are only wasting one more step to get to where we can already reach before. // we can possibly extend our atteinable land! At first it seems like a straightforward DP problem and I did just that and failed at the last test cases which contains 25k elements… Lessons learned, there must be some observations to be made in order to optimize the solution. Let’s optimize it! Note my DP array canJump. In fact, we know there are maximum n steps that we can make on each given position i, therefore the n steps following the positions i are all possible destinations. That is, note how our DP array is set block by block, this means that if we have canJump[i] = true, not only position i is a possible destination, but every elements before it must also be possible destinations. There is thus no need to set them to true again. Therefore, at each position, we retain previously farthest position such that canJump[farthest] = true, we check if i+A[i] would bring us even farther, if yes, we start at farthest and update our farthest position. The complexity is thus brought to O(n) instead of , because we only set each elements to true once, so in total we are still in O(n). Given a binary tree and a sum, find all root-to-leaf paths where each path’s sum equals the given sum. If you do pop, make sure we are always pushing one element on each recursion!